Don’t expect a new wave of democratization. How to explain the Tunisian revolution? By consulting Samuel Huntington—not the Huntington of Clash of Civilizations fame, but the author of The Third Wave: Democratization in the Late Twentieth Century, published in 1991. His model is too complex to be laid out here in all of its subtleties. But the basic message, to borrow from Bill Clinton’s 1992 campaign, is: “It’s the economy, stupid!” We should also add education, urbanization, and globalization—all those items that go into the tale “The Making of a Middle Class.” Tunisia has it all, and that is why it now sticks out like a bloody thumb from the rest of the Arab world, that vast arc from Rabat to Damascus where politics remains frozen, where the birth rate keeps dwarfing economic growth, and where King or Colonel is despotism’s name. 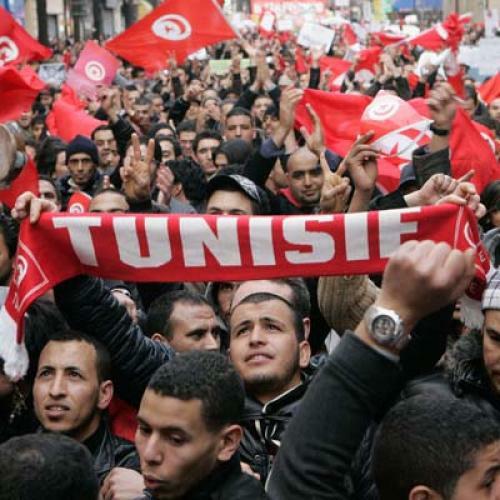 The Tunisian revolt fits Huntington’s model to a T. Looking at the third wave of democratization between 1974 and 1989, he found that rising wealth spells falling tyrants. How much money did it take? A per-capita income between $1,000 and $3,000, which would now be adjusted for inflation. Of the non-democracies which moved into that range in the 1970s and 1980s, three-quarters got rid of their overlords. To illustrate the point, Huntington recalls how the Spanish finance minister predicted in 1960 that his country would tumble into the democratic column once it had reached $2,000. Huntington’s terse comment: “It did”—in 1975. That was then, but what about Tunisia now? The country has a per-capita income of $4,300, which would have been $1,000 in 1975. To make the analogy even more uncanny, let’s jiggle the numbers a bit and use purchasing-power parity. In that case Tunisia clocks in at $9,000—that is, at $2,200 in 1975 dollars. Just like Spain when it went democratic a generation ago. True, Tunisian President Ben Ali has bolted from the country, but there is no Juan Carlos in the game—a figure of authority and legitimacy. Hence, violence erupted, as it did not in Spain. Hence, there is a bloody stand-off, with the old regime holding on to power by inviting a few opposition leaders into the government. Also recall that no regime in the wider neighborhood has been toppled from below—neither Algeria’s nor Iran’s. But, if at all, this miracle will unfold in Tunisia. And why are the other Arab and Maghreb African countries—police states all—proving so immune to regime change (unless there is a little help from the U.S. military, as in Iraq)? Because they don’t make Huntington’s cut. Not counting the petro-potentates (more about them later) and strife-torn Lebanon, Tunisia is the richest of them all. Its per-capita income is almost twice as high as neighboring Morocco, and it is ahead of Egypt, Jordan, and Syria by similar margins. The country is more urbanized (67 percent of the populace) than either Morocco (56 percent) or Egypt, (43 percent). Tunisia is also more educated: Its literacy is a bit higher than Egypt’s and a lot higher than Morocco’s, and it spends much more on education—7.2 percent of GDP, while Egypt devotes about half as much, and Morocco comes in at just 5.7 percent. What about globalization? A rough measure is exports as a share of GDP. Morocco sells just 15 percent of its output abroad, while Egypt’s ratio is 24 percent. Yet Tunisia plays in the league of the highly developed Europeans, exporting almost two-fifths of its GDP. For any Saudi king who finally succumbs, there are plenty of princes to climb into the throne. Apropos of Saudi Arabia with its per-capita income of $24,000. This kingdom, like the rest of the Gulf states, is too rich to turn rowdy. Oil revenue fills the coffers of the government. So why demand representation if there is no taxation? “No taxation without representation!” is the cry of the rising middle class chafing under the knout of the over class. Marx knew this, and so did Tocqueville. None of these societies between the Maghreb and the Arabian Desert has reached the “Spanish tipping point,” and will not for a long time. Tunisia is the odd man out. Josef Joffe is the editor of Die Zeit in Hamburg, a senior fellow at the Freeman-Spogli Institute for International Studies, and an Abramowitz Fellow at the Hoover Institution, both at Stanford.